Sum 41 rocker Deryck Whibley suffers liver and kidney failure after years of hard drinking. Sum 41 frontman Deryck Whibley has posted a startling warning about the dangers of drink after spending a month in hospital with a collapsed liver and kidneys. Avril Lavigne's ex-husband says his boozing has now reached the point where if he has one more drink he will die. In a hard-hitting message on his own website the Canadian rocker said he had been "scared straight" following years of over-indulgence. He said: "The reason I got so sick is from all the hard boozing I've been doing over the years. It finally caught up on me. "I was drinking hard every day. Until one night. I was sitting at home, poured myself another drink around midnight and was about to watch a movie when all of a sudden I didn't feel so good. "I then collapsed to the ground unconscious." The 34-year-old was rushed to hospital by his fiancee where doctors sedated him for a week and placed him on IV drips. "I finally realised I can't drink anymore. 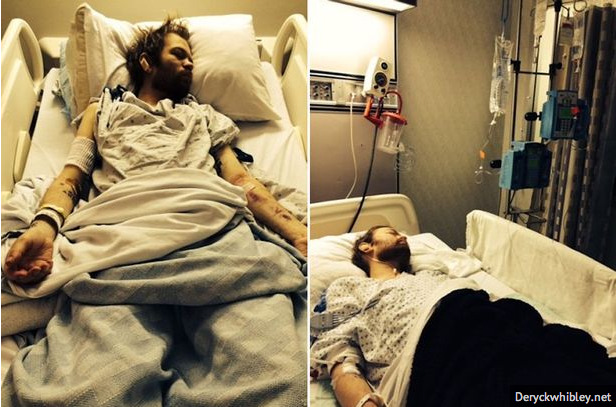 If I have one drink the docs say I will die," Deryck posed on his blog on Friday. "I'm not preaching or anything but just always drink responsibly. I didn't, and look where that got me." Deryck and Complicated singer Avril split in 2009 after just three years of marriage. The Sk8er Boi star is now married to Chad Kroeger, who fronts rock band Nickelback. The musician said the scare had renewed his passion for music and he was already writing new material.